Along with the hot cocoa I made recently, I love making my coffee in the morning. Sometimes, my 9 am class is unbearable without drinking some coffee and eating some breakfast. I really love french pressed coffee and I make it most days. It's inexpensive and it always makes a good cup of coffee! It all starts with the coffee you choose. I love Starbucks coffees and stock up on them when they are on sale at the grocery store. 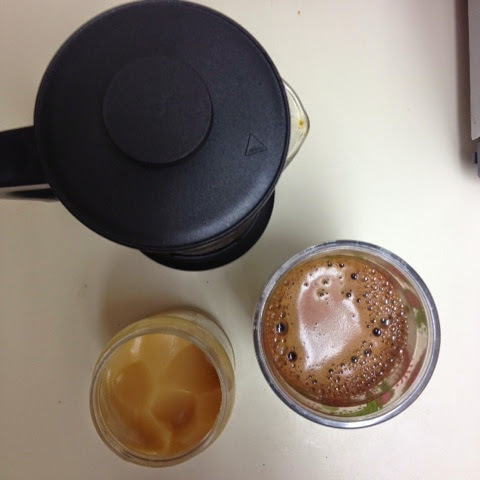 The blonde roast is really good for everyday but the dark roast is what I use to make my thai iced coffee. I get it ground at the store or bring it to Starbucks and they will grind their coffee for you. I keep my coffee in a mason jar in the freezer. I only take it out to measure my coffee out and then it goes right back. It really keeps it fresh! Next, you need a french press. I got my press at Ikea for like $9 but there are a ton of options and price points for everyone. I really like ones that dishwasher safe for when you need to deep clean this baby. For those who don't know how to use a french press, here is a nifty video that taught me how to use mine! I have a smaller french press than in the video but the idea is that same. It makes your kitchen smell heavenly. I also like Keurigs, I have one and I use that for when I don't have time to steep my coffee. Lastly, the sweetener is crucial. I love either 2 Equal in my coffee or a spoonful of this raw honey. It's solid because it has some stuff from the hive like pollen and things in it. It's really good at boosting your immune system slowly and I think it's my key to not getting too sick this semester. It's also great spread on toast! Hopefully, this tutorial will help you make a great cup of coffee and enjoy your mornings more. Fun Fact: If your coffee creates bubbles or a foam when you brew it, it means that it is fresh!